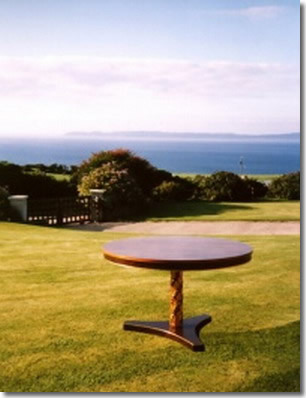 A rosewood veneered dining table on a carved column made by Aubrey at a time when Rio rosewood was still available. 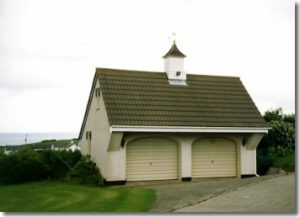 In the background is a sea view of this beautiful area of Northern Ireland. The material for this mahogany piece came from recycled material sent as “skins” or wrappers around valuable imported tropical hardwoods and donated by a friendly timber merchant who, like Aubrey, deplores waste! 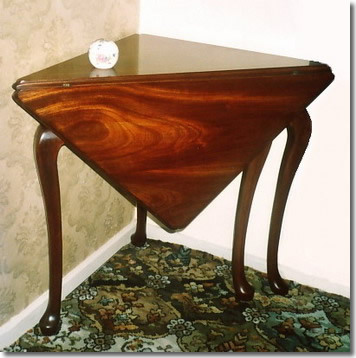 Note the unusual hinging joint, which differs from the traditional “rule joint” seen on drop-leaf tables. The moulding was cut on the router table with Wealden moulding and rebating cutters to arrive at this complicated arrangement. The quaint corners of the table top, which show up when the leaf is “down”, are hand carved, as were the cabriole legs, one of which cunningly tucks in behind another to provide support for the raised leaf. Aubrey’s “piece de resistance” is his entry for a past Woodworker of the Year Competition. 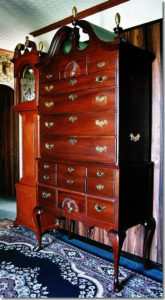 It is a copy of an 18th Century mahogany Highboy in the Philadelphia Style and was the equivalent of today’s sporty Porsche car as evidence of wealth. Few could afford this early example of ‘conspicuous consumption’ and even fewer had house room for this eight foot high chest of drawers. 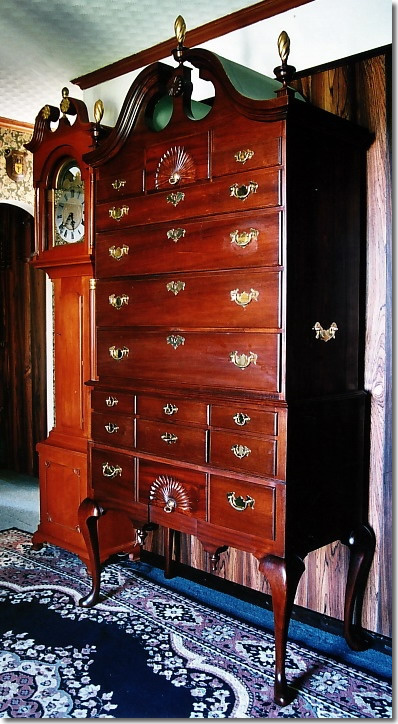 Aubrey remarks: “it certainly overwhelms my little cottage!” Alongside the Highboy peeps out his Longcase Clock made of American cherrywood and also in the 18th century Philadelphia style. 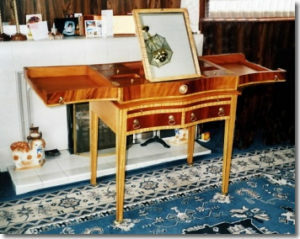 His interpretation of a Sheraton designed lady’s dressing table is shown above. It is made from solid hardwood and veneered in now rare satinwood and mahogany ‘Curls”. The serpentine shaped front includes two drawers and a writing pullout slide, a deep false drawer front and above that a lift-up lid which flips over revealing an adjustable mirror and numerous cosmetic lidded containers. You will appreciate that a lot of accuracy is involved in hinging these unsupported lid flaps. The black inlaid lines on the legs were cut with the help of a 1/16″ straight cutter. A Frank Lloyd Wright (the famed American architect of the 20’s) design for his “Prairie House” made into a bird feeder in Aubrey’s workshop. In the background is a restricted view of the workshop interior, which shows the general overcrowding. 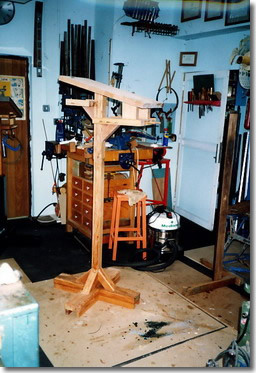 The workshop, unlike those seen in glossy magazines, appears “warts and all” – a familiar state to most woodworkers!